Mewing calls. Song is variable mix of melodious, nasal, and squeaky notes. Phrases are not repeated. Description: Sexes similar. 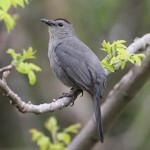 Slate-gray overall; black cap; long, black tail; and chestnut undertail coverts. 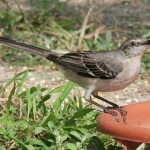 Habitat: Thickets, woodland edges, shrubby marsh borders, orchards, parks, and similar brushy habitats are used by breeding birds. 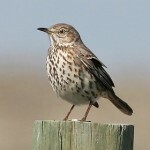 Where in Nebraska: Common spring and fall migrant and summer resident across much of the state, becoming rarer northwestwardly. Apparently declining in Pine Ridge area, where habitat is decreasing. Field Notes: Some individuals are good mimics. 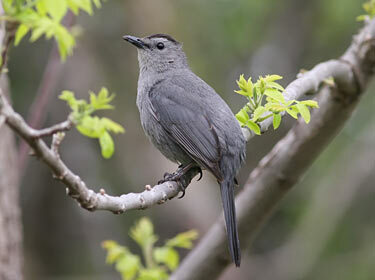 Fun Facts: The Gray Catbird’s long song may last for up to 10 minutes.